http://kiribeth.blogspot.com/2014/01/...I love fantasy stories, so ever since I heard the Jessica was working on this story, I was eager to read it. I liked this one better than her previous book (Annabeth's War), because the characters had more depth to them. You really get to know the main characters, and their voices stay with you after you finish the book. Alexandra I was almost predisposed to be annoyed with because she seemed like she was going to be a scared damsel and idiot from the first chapter, but that goes to show how first appearances can be deceiving. She had a lot of character development, and I liked her a lot by the end.The plot moved rather quickly at first, and it immediately caught my attention from the first page. Things slowed down some near the middle, but Jessica did a great job of keeping the intrigue and suspense up that kept me reading so that I might find out what happened next and how everything was going to turn out in the end. A major twist near the end surprised me, but it played very well into the rest of the novel, and I have to applaud Jessica for that. The end was a bit rushed, I felt, but satisfying.Advisory: This novel was definitely more violent than Annabeth's War, but it wasn't anything terribly graphic. There are some bloody scenes and sword fights, and for that, I'd recommend the book for readers 12 and up.There is also some romance between two characters, and while there was a lot of physical contact between them (i.e. hand-holding), it didn't get out of control, and I thought Jessica portrayed it well. The beginning had me starting out thinking I would not like this book. Typos, inconsistency and odd wording were distracting, and the heroine was supposed to be sixteen but felt more like eight and was a timid, self-centered, emotional sort that I don't get on with. However, once the story got going, I was pleasantly surprised to find that those were, mostly, my only complaints. The characters came to life and were enjoyable to read about; the heroine grew on me (eventually... Though she still seemed younger than her sixteen years) and I really liked Taleon! Aric was cool, and baby Brandon entirely adorable. I loved the medieval setting in this place called Chambria -- it pulled me right in. Raven Castle came very much alive to me. I quickly realized this was a story focused on character growth which was a nice change from a constantly exciting book. Granted, there was excitement and peril near the end (so don't worry if you like your books more action-y) but I also enjoyed the leisurely time spent getting to know the characters and spent in sweet little moments of touching encounters with people. The dialog especially was great fun to read, and the heroine and Taleon were a fun pair to read about. I like them very much. :) There were a couple story threads I expected more to happen with but didn't (Arthur, for example...) which was slightly disappointing, but overall it turned out far better than I expected, and I find that I greatly enjoyed it! I'll be looking for more from this author. Overall, it might have done well to have another edit, but the problems weren't as bad as some self-published books I've read, and mostly made up for it with the characters and story itself. It's a good adventure if you like more of a focus on deep and loveable characters and great dialog, with some scariness near the end to keep you on the edge of your seat. A thoroughly enjoyable read. Captive of Raven Castle is Jessica Greyson’s second novel. After reading her first, Annabeth’s War (and loving it! ), I was really excited to read this one. Alexandra is going to be the next queen. But she is sickly, weak, never questioning… and believes she will live perhaps long enough to bear an heir for the throne. Then one fateful day, her carefully-laid-out life changes forever when she is snatched by one of the rebels from Raven Castle. There at the notorious fortress, Alexandra is pummeled left and right with things she just cannot comprehend. Could her whole life have been a lie? Could Aeric and Taleon actually be potential loved ones instead of foes?Captive of Raven Castle started out fast-paced and exciting. I was quickly drawn into Alexandra’s world, and the sinister twists and turns going on. There were some mysterious revelations, and unexpected happenings. Love and poignant lessons abounded. Jessica Greyson writes in a more simple way that is mostly easy and fun to read. Her book has just a touch of romance, sweet and endearing; yet bears quite a few violent or gruesome scenes/conversations, so I would caution younger readers. I myself would prefer not to know how an evil guy is planning to kill someone… but yeah. Alexandra/Cassandra was an interesting, even unusual character. I liked how she was so real! Not like some tough, I-can-protect-myself!, super heroine kind of woman, but instead a confused and rather frightened girl who is struggling to cope with the change being thrown at her, and with the courage to do what she utterly fears. All her spurts of emotion made her more life-like to me. You’ll see in the end that the heroine of this story is sort of “let down” by those she loved. It was kind of hard for me to comprehend this. Could a father really choose something else above his daughter’s life? It kind of felt like there was too much weight put on being king. However, the reasons did become clearer and more sound as the story progressed. I suppose I would just have liked it if the father prayed, and then let his daughter go because he felt that that’s what God was directing him to do, and trusted Him to take care of her! Perhaps that’s what he did… Anyway, an adventurous, surprising, and fun story overall. It did have a darker theme, but ended quite well. 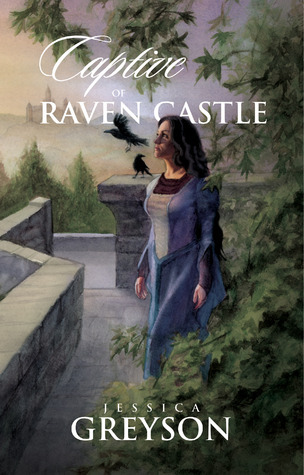 The Captive of Raven Castle is a poignant historical of war, sacrifice, and joyous reunions. Wow is the only word to describe Jessica Greyson's newest book. I read it all in one day because it was so awesome. The one thing that stuck me in this book as better then Annabeth's War was how much depth she gave the characters. I really got to know these characters hearts, how they reacted in any circumstance and also a bit more about their physical appearance which helped me imagine them so much better. I only have two complaints, one the first 100 pages were infuriating because of all the confusion but that quickly dissapered as you get to know the story. Also Jessica's books are NEVER long enough, they couldn't be long enough to satisfy me, at the first quarter I was wondering how she was going to drag it out but by the halfway mark I was wondering how she was going to finish up. Overall this book was AWESOME, I don't think Jessica Greyson could come up with a bad plot. I'm looking forward to reading her next book when it comes out! Age Appropriate For: 13 and up for very mild romance and mild violenceBest for Ages: 13 to 25Even though I knew that none of Greyson’s books could ever come close to AnnaBeth’s War, I have been looking forward to Captive of Raven Castle. From page one I was sucked into the story and I found myself loving this book even more than AnnaBeth’s War. How is that even possible?Alexandra tugged at my heart, as everything that she has ever known is challenged after she is kidnapped. Everything from who is king, who her father is, who are her friends and who are her enemies. Some people found her frustratingly slow, but I felt sorry for her and her slowness understandable.Taleon made an awesome hero, almost as awesome as Ransom. His kindness and patience with Alexandra was as touching as the moments he pushed her to face the lies she had always believed. There was a bit of romance, with some hand-holding and dancing, but that is as far as it went.This story was a bit more violent than AnnaBeth’s War, but nothing was too graphic. This story was different, but so amazing. It was gripping and kept me turning pages. I loved every page, and I will be rereading it in the future.I highly recommend this book for those who love adventure, princess, and strong female characters. I enjoyed Jessica Greyson's other novel, Annabeth's War, and was eager to dive into this book. It was even better than Annabeth's War and kept me hooked from the beginning. This book had some good characters and great struggles and battles to overcome. I really enjoyed it and recommend it to anyone who likes fantasy and stories of faith and forgiveness. Looking forward to reading any other books by Ms. Greyson! About the Book:The troubled people of war-torn Chambria are on the brink of starvation, and a delicate princess with a recurring nightmare is their only hope. Alexandra knows that her value to her country consists mainly in her ability to marry well, but when she is kidnapped by the rebels and taken to meet the man claiming to be both Chambria’s true king and her real father, her entire world falls apart. Will Princess Alexandra be able to untangle the web of lies and discern who is the true king and her father?My Thoughts:When I heard that Jessica Greyson was coming out with a new book, I was absolutely ecstatic. I had loved her first book Annabeth's War, and was thrilled that she was coming out with a new book. So, I had super high expectations going into this book, and honestly, I wasn't let down a bit. In the beginning of the book, the main character, Cassandra/Alexandra was a bit of a snob, and I didn't like her a bit. However, as the story progressed, she grew on me, and by the end of the book, I admired her.Like her other book Annabeth's War, this was an adventure story, and I really enjoyed the high- energy of this book. It had me captivated from start to finish, and I loved the way the story progressed. Jessica Greyson's working of the characters was wonderful. She made me love the good characters and hate the bad (Like anyone could like Archibald. Seriously. He was horrible). The story is not necessarily romance, but there are some romantic scenes in this book. I really appreciate that there is no kissing or intimate romantic scenes. It makes me respect the characters and especially the authoress. There was a satisfying ending to the story which closed it up in such a wonderful way. Overall, I really enjoyed this book, and am looking forward to read any more of Jessica Greyson's books. I'd recommend this book to those ages 13 and up. I really enjoyed the story. It started a little too fast for my taste. I didn't feel like I had enough time to know the character before the trials came. But that was quickly remedied as the story went on, and I enjoyed the character development of Alexandra.I love fantasy stories that don't have magic and strange creatures, their just set in a made up world and this story fits that well. This was as good as Annabeth's War. Different enough, but with the same writing style and some similar circumstances. I think Alexandra's reaction to being told that every thing she believed was false was very realistic. About the book:The troubled people of war-torn Chambria are on the brink of starvation, and a delicate princess with a recurring nightmare is their only hope. Alexandra knows that her value to her country consists mainly in her ability to marry well, but when she is kidnapped by the rebels and taken to meet the man claiming to be both Chambria’s true king and her real father, her entire world falls apart. Will Princess Alexandra be able to untangle the web of lies and discern who is the true king and her father?My Thoughts: Poor sixteen-year-old Alexandra was thrown into a life of uncertainty not knowing whom to believe and who might be her friends or enemies. Her one solace was in taking care of baby Brandon. Fortunately for her Taleon was one who looked after, guided, protected her and helped her find out the truth about her heritage. This book was filled with a lot of details some were on the more graphic side but the romance was mild and of a sweeter nature. Alexandra's character stole my heart and I was hooked from the first page.I enjoyed this book very much. Jessica Greyson has done it again. Set in the same fictional world as her earlier book, Annabeth's War, she has once more managed to write a heroine who beautifully showcases feminine strength. This time, however, you might not recognize it immediately, and the story of the Princess Alexandra is a far different one from that of the Belterran sword master's daughter. The way Alexandra grows and changes throughout the book is delightful to see, and Taleon, as one of those demanding her growth, is one of my favorite characters.It is Alexandra who I love most, though, and her struggle to understand the truth behind the lies that surround her will catch your imagination and your heart, and hold them both long after you finish reading. This is the story of a girl every inch a princess, and what happens after rebel forces kidnap her and turn her life upside down makes a book you won't want to miss.Torture and true love, laughter and tears, sword fights and sacrifice: all are woven beautifully together into the unforgettable story of the Captive of Raven Castle. What a journey this book has brought me on. So much happened in such a short time. I laughed, I cried, and I occasionally cringed. The dialogue between characters was amazing as well. Despite the occasional grammar mistake and typo, this book was wonderful and so fun to read. I can't wait to read another one of Jessica Greyson's books.